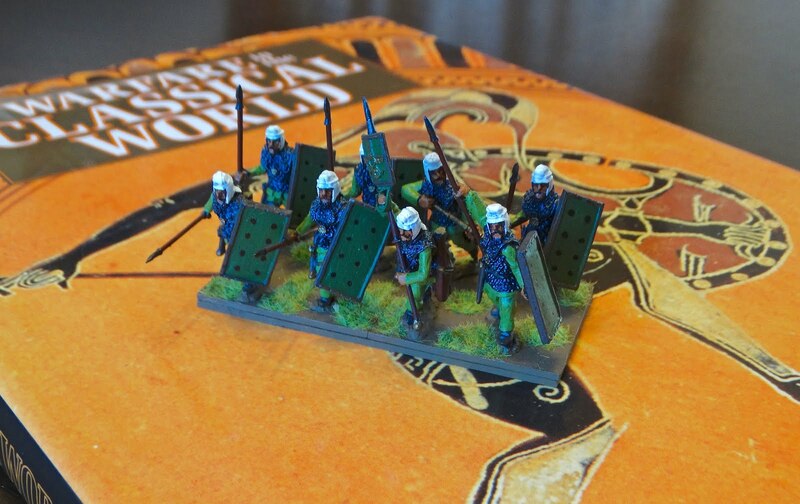 With the crappy Warlord Games figures placed in the spares box (see previous post), I decided to splash out and get myself a painted unit of HCH Figures Immortals. Now, I acknowledge these figures (from the Tin Soldier range) may not be to everyone's taste, being perhaps a bit old-fashioned in look, but I have come to like them very much. As usual, customer service was excellent. The lady at HCH was willing to swap a couple of shields so that my officer and standard bearer shields matched everyone else's. The figures were despatched the same day as they were ordered, and arrived next day, Royal Mail first class. Each figure came in its own bubble wrap pocket, with shield and spear individually wrapped in tissue paper. And all this for less p&p than Warlord charge - I have waited a week for my Warlord orders to arrive. The photos below will, I hope, speak for themselves. 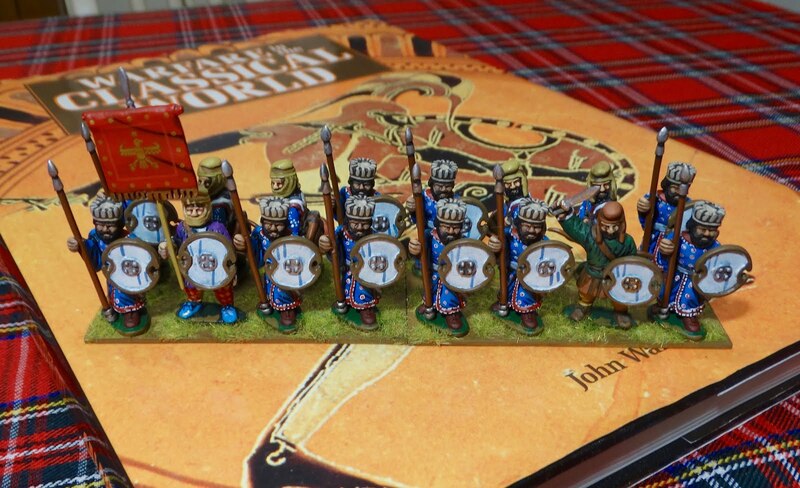 Total cost including 16 figures, painting and p&p was £66.50, or £4.15 a figure. I had to assemble the figures and base them myself. The quality of painting alone makes this price a bargain, IMHO. As you can see, the spearmen come without bows so I added in 4 bowmen figures to give the impression of a unit with both shooting and toe-to-toe melee capability. A great unit which I can't wait to get on the table. Eat your heart out Warlord! 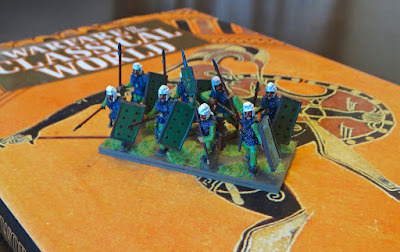 Warlord Games' ancient range has been one of my two main sources when building up my ancient armies - the other being the Victrix plastics range. Warlord's plastics are excellent - lovely models and well priced. Their metal figures - well, I have my doubts about some of them. Their Companion Cavalry, for example. Nice figures individually, but really too delicate for wargaming, especially the spindly legs of the horses. And they also suffer from a more common fault with modern figures that I find particularly irritating - the apparent need for variety in figure poses, and for those poses to be of the 'action' variety. So those Companions are all waving their xystons around with gay abandon, doubtless poking each others eyes out and wounding each other's horses. 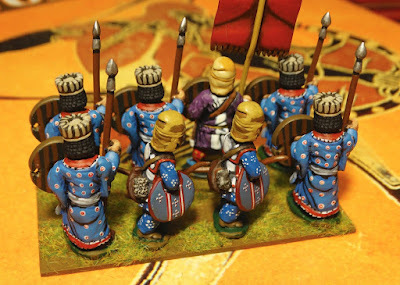 This exasperation with the need for action poses reached its peak when I purchased a unit of Warlord's Persian Immortals. Of course, they look great in the beautiful pictures on the Warlord online shop, but I got increasingly frustrated as I put the figures together, then painted and based them. 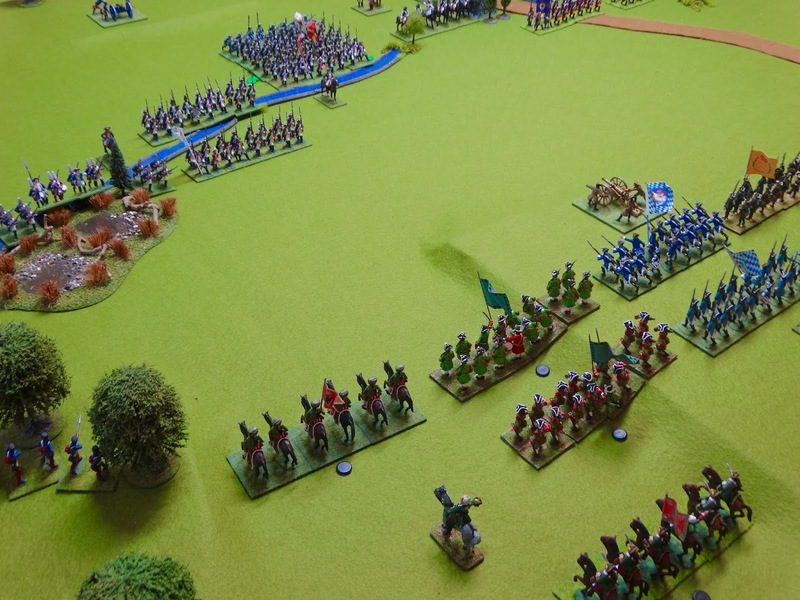 In my opinion, the problems are twofold - history-wise, and wargaming-wise. Historically, I am under the impression that the Immortals were basically heavy infantry, relying on cohesion and formation to fight effectively in melee. Yes, I know many gamers might class them as 'mediums', depending on what rules one is using, and also that they carried bows and had a significant shooting ability. But nevertheless, to fight in the line of battle (as they did), they fought in formation using big shields and long pointy things. And those shields in particular had to form a solid front if they were to provide proper protection to the formation as a whole. 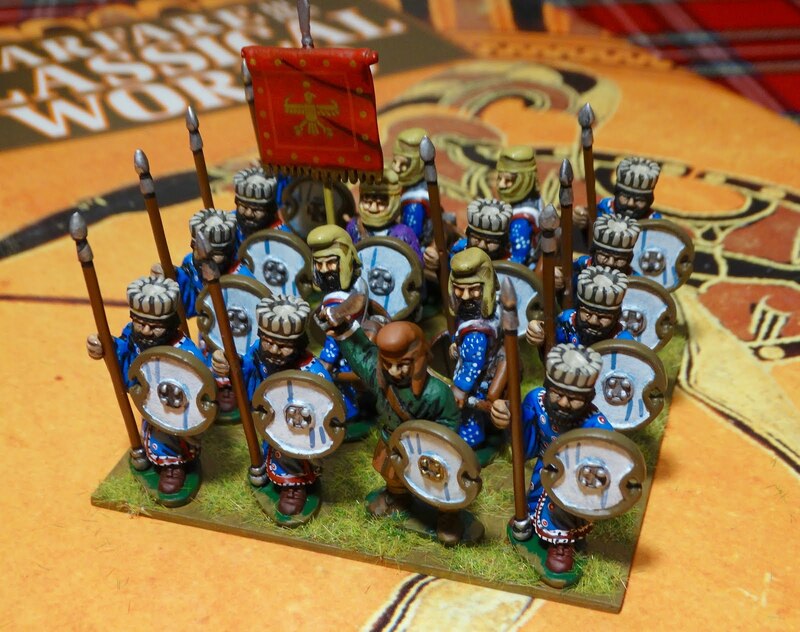 Sadly, Warlord have decided to model these guys basically as a bunch of skirmishers. As the photo shows, the poses are varied and decidedly of the 'action' variety. Most figures seem to be running, and in true Warlord fashion they are also waving their spears around and flinging their shields wildly at their neighbours. How they will reach the enemy without tripping over their shields and getting gored by their comrades is hard to imagine. And the hoplites they're charging are probably laughing their heads off at how easy it will be to get inside that ineffective line of shields and swiftly gore the Persians to death. And from a wargaming point of view, all this variety causes real problems when basing. Getting them to fit on my fairly standard heavy infantry bases (20mm per figure) needed a lot of fiddling around, as the shields and spears took up way too much space and the selection of poses creates too many problems in the way figures interact with each other. Arranging the group bases is made even more tricky by the tiny individual bases the figures are cast with - the buggers just won't stand up reliably whilst you juggle them around, trying to get a suitable set-up. And when this is finally achieved, the result is so irregular you can hardly pick up the finished bases to move them around without inadvertently bending a soft metal spear or breaking off a shield. Having completed 8, I have decided to set these guys aside and buy something more suitable. I'll probably get the HCH Figures Early Persian Immortals, ready painted. 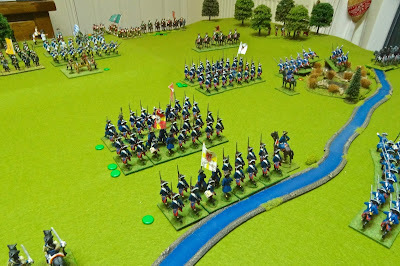 Check the link - that's how heavy infantry for wargaming should look. Now, for 16 figures that might well set me back nearly £70, but I reckon I will treat myself. That new tyre for the car will have to wait until next month. At least I'll keep my sanity. Cheers - until next time. Yes they are. 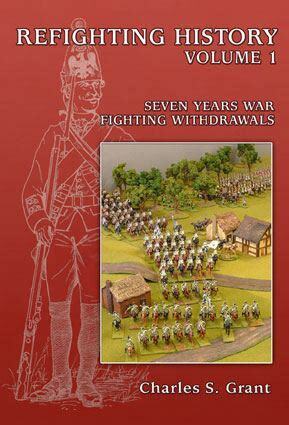 It was time to give my 'Simple Seven Years War' rules a proper name, and some recent reading reminded me of this phrase. It keeps the 'honour' theme going nicely. Of course, the 'post of honour' is on the right of the line, as I'm sure you all know. It has been rewarding to see some gamers having a go with my 'Simple Seven Years War' rules - see here for example. But there's no getting away from the fact that a good deal more playtesting is needed to improve them. Of course, the best kind of playtesting is the kind that involves other gamers, especially those working just from the rules as written, well away from the author. But solo playtesting is bound to be needed as well, particularly in the early stages of development, when you can mess around with ideas without boring other participants in the game. So I set out to play a decent-sized solo game with the new rules. 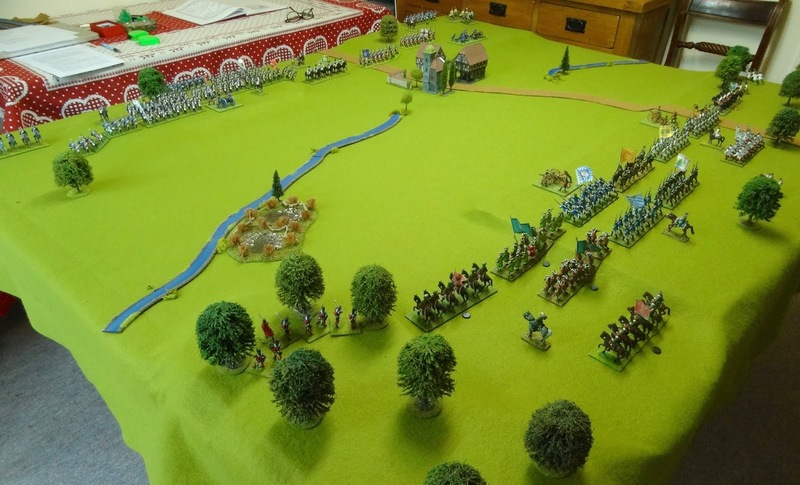 To give added interest, I thought I'd make it a proper outing with a nice scenario and a reasonable number of troops. This brought to mind Charles S. Grant's Refighting History (Volume 1), which has been on my bookshelf for a couple of years without the gaming inspiration contained therein being properly exploited. A brief overview of my thoughts on the book can be found here. 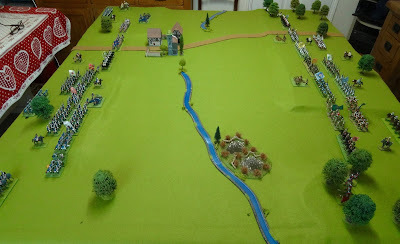 The first scenario in the book, 'The Combat At Asch' seemed like just the job. As Charles says, "the Combat at Asch has all the makings of a nice balanced action with not hugely disparate forces". 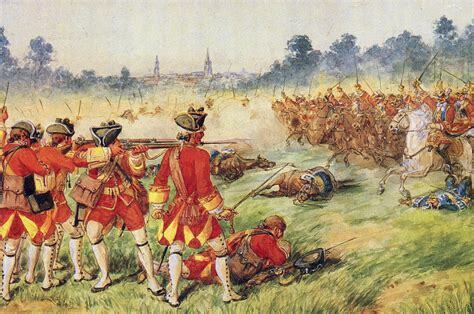 The fighting occurred between Prussian troops which were part of the army of Frederick's brother, Prince Henri, and a detached Austro-Imperial force from the army of General Zweibrucken. The town of Asch is present day As, in the extreme west of the Czech Republic. 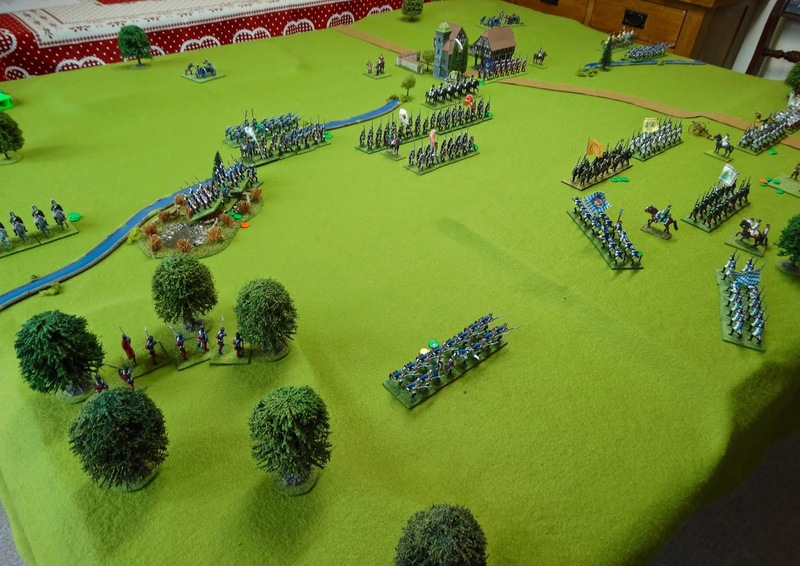 The Prussians were very much the attacking force in the real campaign, and Charles first presents the encounter as it was in real life - a fighting withdrawal by the Austro-Imperials. He then imagines the Austro-Imperials standing and fighting to produce an attack-defence game, and this latter seemed to be the one for me. The fact that this is not what occurred in real life makes the game an interesting combination of the historical and imaginary. 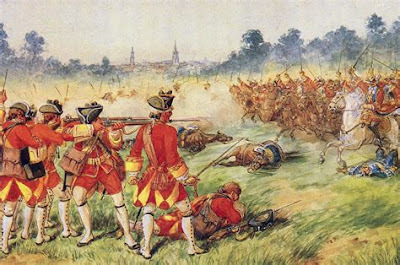 The date of the imaginary battle would have been 8th May 1759. 1. Darmstadt Grenadiers (presumably the Hesse-Darmstadt leibgrenadiercorps). Regular. 2. Regiment Maynz (Reichsarmee, 4 battalions, apparently well thought of). Regular. 3. Regiment Trier (Reichsarmee, 2 battalions, poor quality). Inferior. 4. Regiment Salm (Austrian IR14, 1 battalion). Regular. 5. Regiment Marschall (Austrian IR18, 1 battalion). Regular. 6. Regiment Gyulay (Hungarian IR51, 1 battalion). Regular. 7. Unnamed 'Croats'. Assumed to be 1 battalion of light infantry. Regular. 8. Old Modena Cavalry (Austrian cuirassiers). Superior. 9. Baranyay Hussars (Austrian HR30). Inferior. 10. Empire Cavalry Detachments (assumed to be dragoons). Inferior. A. 2 Field Artillery Batteries (based on a given total of 7 guns available). Regular. 1. Grenadier Battalion Bornstadt (Gn.Bn. 13/26). Superior. 2. Regiment Bernburg (IR3, 3 battalions). Regular. 3. Regiment Puttkamer (IR9, 2 battalions, apparently highly regarded). Superior. 4. Regiment Goltz (IR24, 2 battalions). Regular. 5. Frei Bataillon Colignon (FB2). Inferior. 6. Frei Bataillon Monjou (FB5). Inferior. 7. Horn Cuirassiers (CR7). Superior. 8. Szekely Hussars (HR1). Regular. 9. Belling Hussars (HR9). Regular. A. 3 Field Artillery Batteries (based on a given total of 10 x 12 pounders). This was generally good news as the Prussians (as I had hoped) had a worthwhile edge in quality which would give their attack a fighting chance. The book contains a whole series of good maps for this scenario, which makes setting up a reasonably accurate table for the game so much easier. Table size was 6' x 5'. I had a little experiment with Word and managed to come up with the colour map you see below. My thanks to Dinos at the HoW forum for showing what is possible with a bit of trial and error. Prussians in blue, Austro-Imperials in red. All hills are gentle. The watercourses count as streams. 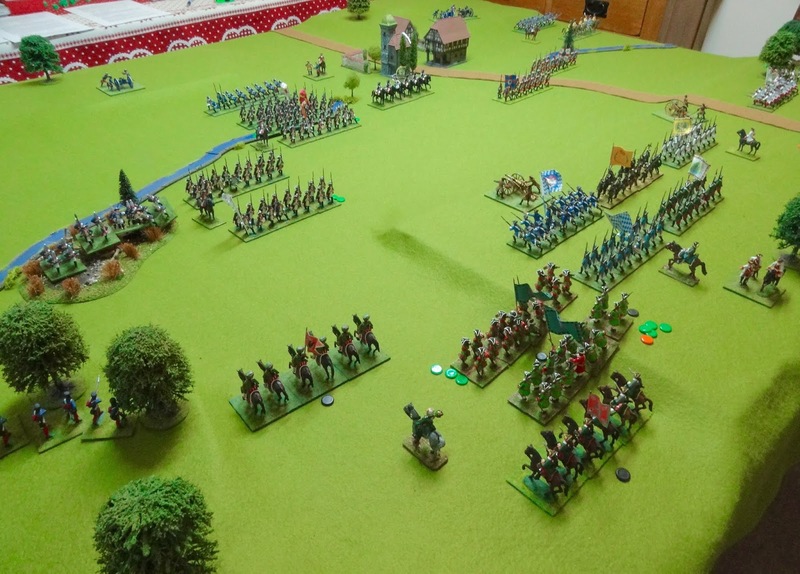 The scenario was simple - the Prussians will attack and dislodge the Austro-Imperials from their ridge-top position. As usual, I will eschew a lengthy narrative account and use some captioned photos. Set-up 1. The hills were replicated by using a felt cloth over TSS tiles of various shapes and sizes. Unfortunately the hill outlines don't show up all that well on the photos. Set-up 2. The arrangement of forces was as per the historical deployment. This found the stronger part of the Prussian line opposite the weak Trier regiment. On this flank the better quality Austro-Hungarian units face a thinner Prussian presence. Here they come! 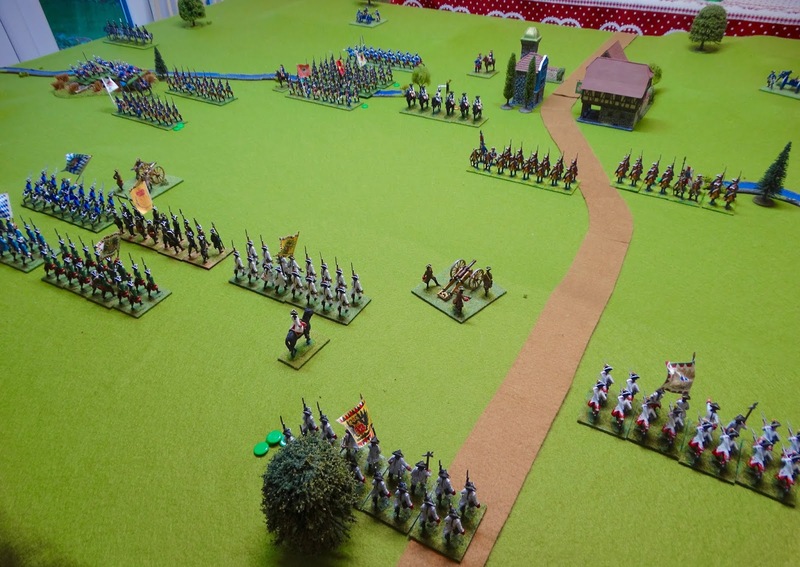 Prussian infantry strike at the Austro-Imperial left flank. The Bornstadt Grenadiers are hindered by the marsh. The Puttkamer regiment advances. Even with artillery support, the odds are against them. plugged by the Gyulay regiment. The Goltz regiment gets into musket range. are in the wrong place and would be invaluable on the Prussian right. 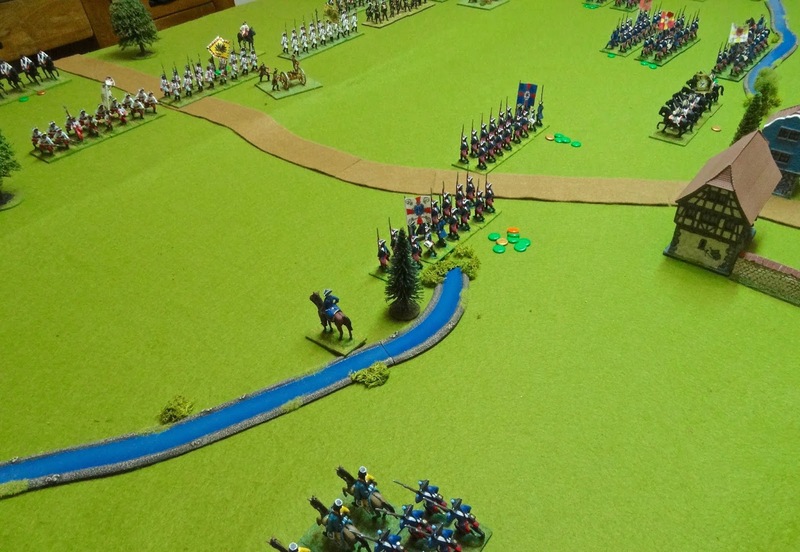 On the other flank, Puttkamer take heavy casualties from Austrian muskets and canister. Their superior quality is not enough to overcome the odds, and they are forced back. 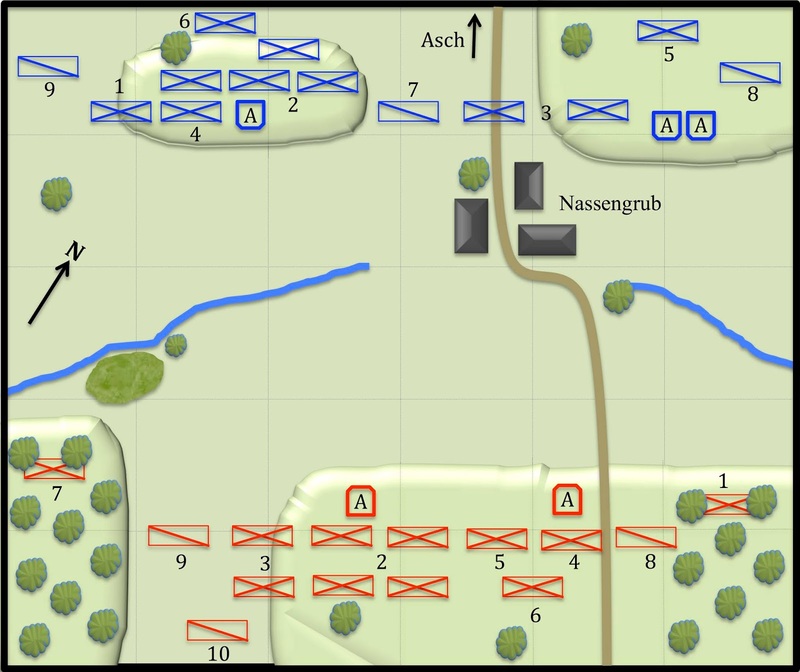 Regiment Trier has evaporated, and the Prussian grenadiers have forced away the poor quality cavalry units. with heavy casualties. Further assaults are unlikely to succeed. I called it a day at this point. 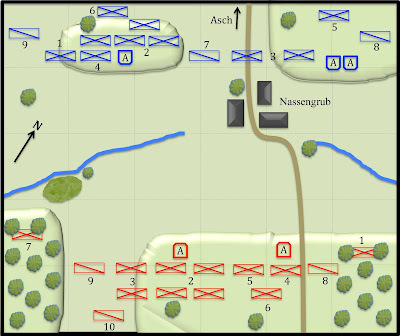 The Prussians had done well, driving off 5 enemy units on the Austro-Imperial left flank (including an artillery battery), but the main ridge position was still strongly held by good quality Austrian units, and the attacking Prussian infantry had taken serious casualties. As they began to waver, the Bornstadt grenadiers were left feeling rather exposed, as the final photo shows. Reforming for a second assault would be pointless and almost certain to fail. In an interesting side show, the Croats in the woods on the Austro-Imperial left had seen off two charges by the Prussian Hussars. Well done lads! The rules worked well, as far as I was concerned. 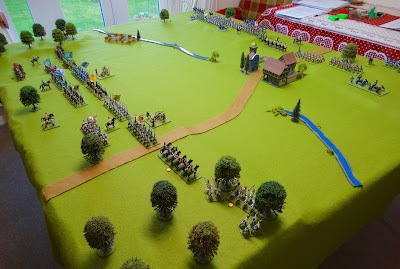 My nagging doubt is that rules trying to be 'simple' really need a clever mechanism or two to make them interesting and engaging to play, or they tend to become a bit bland. Whether I can find the inspiration for some original procedures remains to be seen. 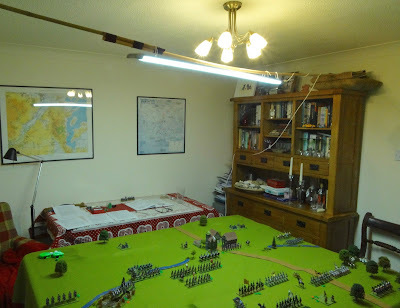 In my search to improve the quality of my wargaming photography, I decided to improve my lighting by the Heath-Robinson set up you see below - a cheap LED strip light rigged up over the table. This produced much better colour matching, but really crisp results still elude me, despite the dining room being lit like a Dentist's waiting area. The search continues! Thanks for popping over. I think perhaps some Kings of War Historical action may be next up.